Its an idea that has been thrown along for as long as I can remember, it seemed simple enough, there are two flying Lancasters in the world, why not get them together? While on paper it sounds easy, there is the small issue that a rather large ocean separates them. Unlike their smaller warbird cousins Lancasters can’t really be dismantled and put in shipping containers, certainly not if you want to fly them again any time soon. It would mean a trans-Atlantic flight in a four-engine, 70 year old, World War 2 bomber, presenting huge risks and high hours on the airframe. Hence, most of us thought it was simply a pipe dream. That was of course, until earlier this year, when the Canadian Warplane Heritage Museum, dropped the bombshell (pun intended), that they would be bringing their Lancaster over for a tour in August. This set the aviation world into frenzy, speculating when and where the two Lancasters would be getting together during the tour. I was lucky enough to visit the Lancaster while in Canada (booked the trip with finally seeing a second Lancaster in mind before the announcement, if only we’d known!) Vera is in amazing shape, and it was wonderful to walk around so close to the aircraft and talk to the people who keep her going. “Vera” in the temporary markings of “R for Ropey” at Hamilton in June. Move forward now to the 4th August and I was watching a local Canadian news station for hours at a time hoping for a glimpse of “Vera’s” (a nickname drawn from the aircrafts code letters of VR-A,) departure on the first leg of her journey. But it wasn’t to be, due to a magneto problem leading to a flooded engine. Thankfully day 2 brought better luck, with the first leg being completed without trouble. The next few days saw the crossing completed in good time, sadly arriving to typical British weather, meaning the Lancaster only just made Coningsby, unable to perform the planned fly-pasts for its arrival. The arrival festivities were planned to include the first formation flight of two Lancaster’s in over 50 years, a spectacle we would have to wait a little longer for. Not too long however, once the Canadian machine had essential post trip maintenance performed it was ready for display duties, within 5 days of arriving the two aircraft were up practicing for the busy six weeks ahead. I’ll admit that like many, I assumed that the two aircraft would merely be in the same piece of sky, separated by a runway length. So I was happy to be proved wrong as the first shots of the pair emerged online, they weren’t closed in like the Red Arrows, but they were as close as I imagine is comfortable in these big, old aeroplanes. Soon enough it was time for their first public outing at Eastbourne’s seaside show on the 14th August, which was met with much fanfare. The same day also marked my first sighting of the pair, at Biggin Hill. They were based out of the Kent airport for the weekend. I decided it was best to go out and see the pair as soon as was feasible, with Biggin Hill a short drive away, the chance to see the Lancasters arrive and land was too tempting. 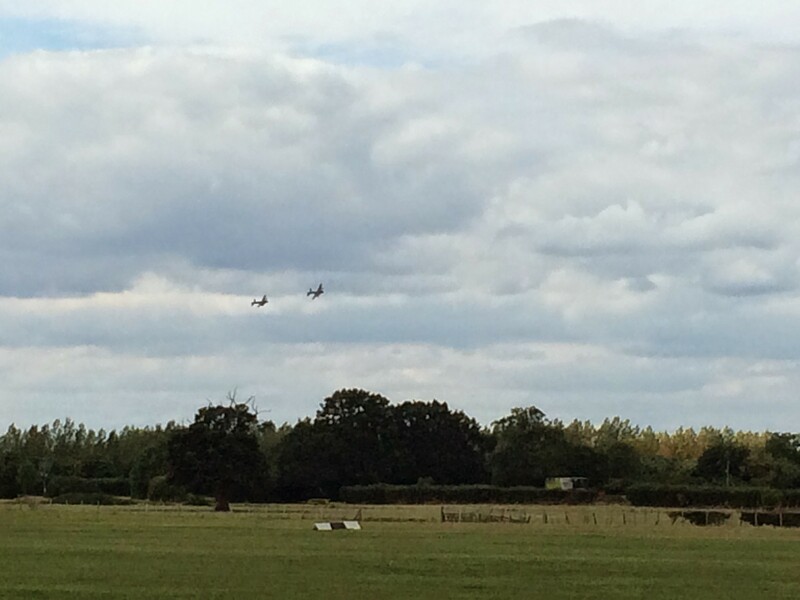 My first sighting of the Lancaster pair. As we arrived however we were met by heavy rain and dark skies. I was watching twitter on my phone trying to find out where the Lancasters were and whether they had diverted. Eventually a goosebump inducing sight appeared on the horizon, two lumbering silhouettes against a dark sky made there way across the far side of the airfield. Evoking images of squadrons returning home after a raid. I can’t describe exactly how I felt in that moment, but I know that feeling will stay with me for the rest of my life. It was a sight many had spoken of, even dreamed of over the years and yet here it was happening in front of me. The sound alone was worth the Canadians coming all this way. Incredible. Both Lancasters then formed up with a pair of Spitfires for a run and break to land, standing at the end of the runway by the perimeter fence meant that all 4 aircraft flew right over our heads at low level. Watching two Lancaster’s fly the downwind leg, gear down and follow each other into land was an amazing, if surreal sight. What a way to experience two “Lancs” for the first time! 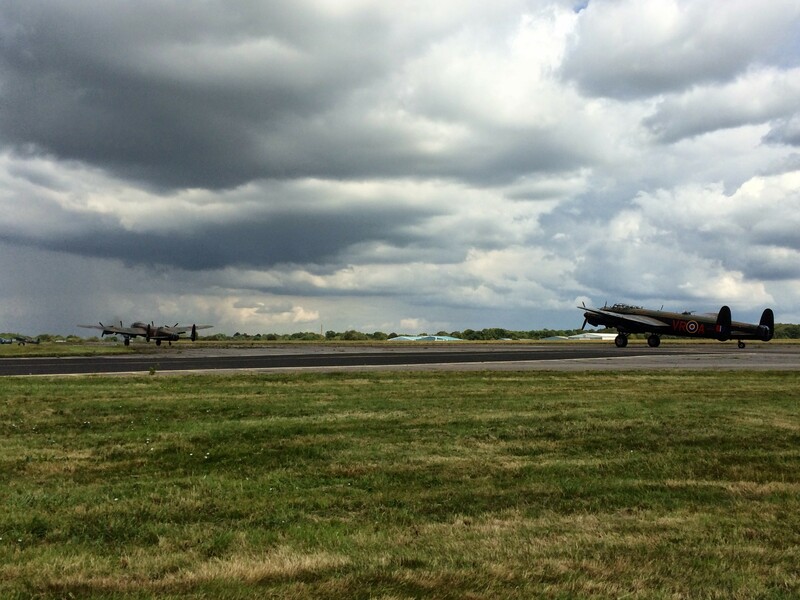 Both Lancasters waiting to depart at Biggin Hill. The first display venue I saw them at was my local airfield, Headcorn. Seeing just the one Lancaster display at this small grass airfield was always a treat so seeing the pair was an amazing opportunity. The two Lancs displaying at Headcorn. The quality of the display has been a hot topic during the tour, and there are cases for both sides. It was in essence a series of fly-pasts with a gentle 360-degree turn in the middle, but what else can we expect from two large bombers in formation? Given that the tight schedule of the tour, combined with losing a practice day to weather meant that they only had a few display work-up flights, I think it was a well-put together display. After all, the purpose of the tour was to get the two Lancasters together, which is what we got. Formation changes would of course have been nice, but any additions to the routine may well have eaten into the tour schedule. Personally I’d rather more people saw a simpler routine. A solo routine from the Canadians, given their reputation for putting the aircraft through its paces,would have been a good addition, but the important thing here was the pair, which was well shown. The highlight of the tour for me came with the “3 Sisters” meeting, when the two Lancaster’s flew a formation tour with the Avro Vulcan. I managed to catch the flight at RAF Marham, their final stop. After waiting anxiously at the end of the runway the three aircraft finally came into view, flew the length of the airfield towards us, just as they reached us the Vulcan applied high power and climbed out of the formation, letting out a trademark howl as it did. 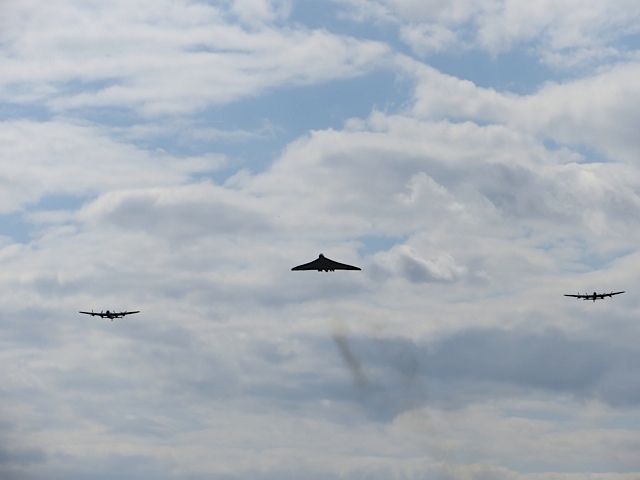 Then came the surreal moment of watching the Vulcan climb away as a pair of Lancasters came roaring over our heads. Another 10 minute Lancaster display followed, with clear Norfolk fields, hundreds of Lancaster chasers aside, as a backdrop. It really was a perfect day. The tour seemed to be going swimmingly for all involved at this point. The Canadians had just paid a visit to Teeside Airport, formerly RAF Middleton St George, in county Durham. 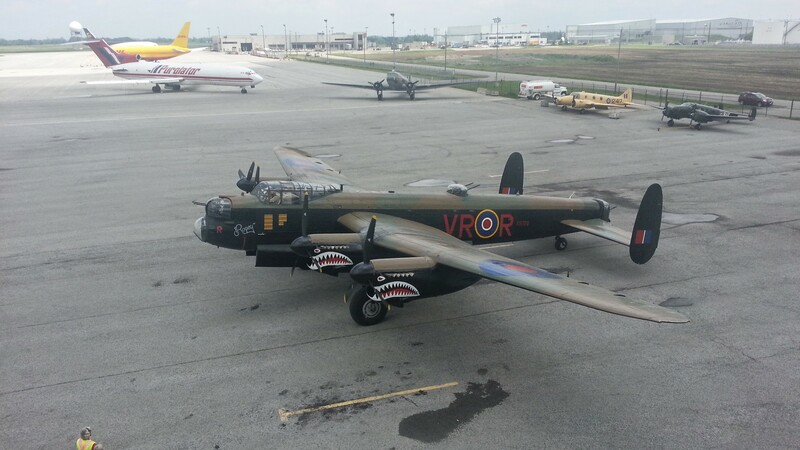 Canadian Lancasters, including “VR-A”, the aircraft Vera depicts, were based there during the war. On departure from the airport back to Coningsby the aircraft developed an engine fault, which led to a three-engine landing and an engine change required. This was of course a huge blow to the entire community, especially as a big weekend for the pair was lined up, with Shoreham and Bournemouth airshows planned, not to mention countless fly-pasts. 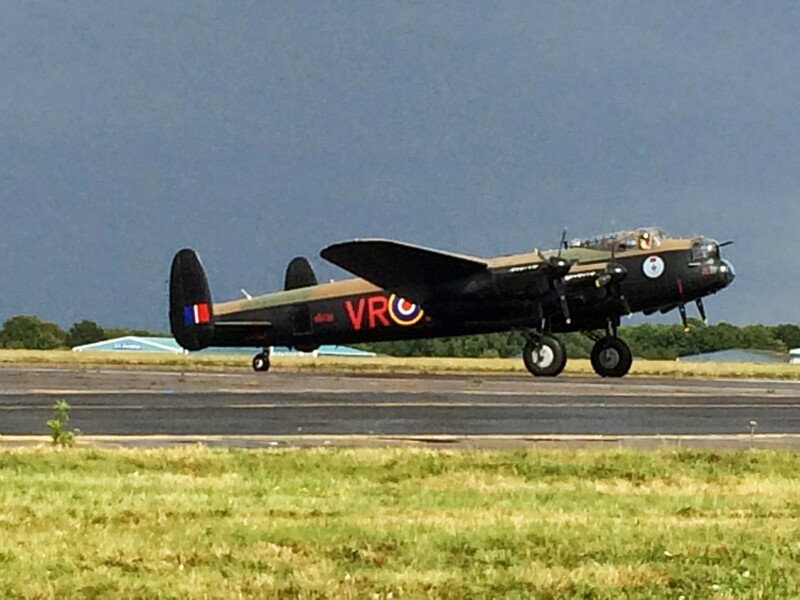 With help from the BBMF team, who supplied a spare engine, they were able to get the Lancaster flying again and back at Coningsby within a matter of days, meaning that only a weekends flying was lost, rather than what could have been the end of the tour! Other than this one blip, only two other airshow days were lost to weather. On the second occasion, the Saturday of a busy weekend had to be scrubbed, missing out a number of fly-pasts and appearances in Scotland and Ireland. All credit to the tour crews as they pulled out all the stops on the Sunday flying all day in order to get both days worth of appearances in. Including a short time on the ground at Prestwick, meeting their static display commitments. 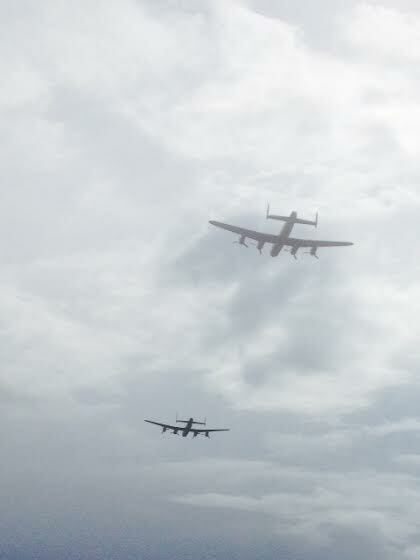 I managed to catch the Lancasters a few more times across the tour, each time that I did, that indescribable feeling never went away, it was as incredible a sight at Goodwood when I saw the pair for the last time as at Biggin Hill when I saw them the first. 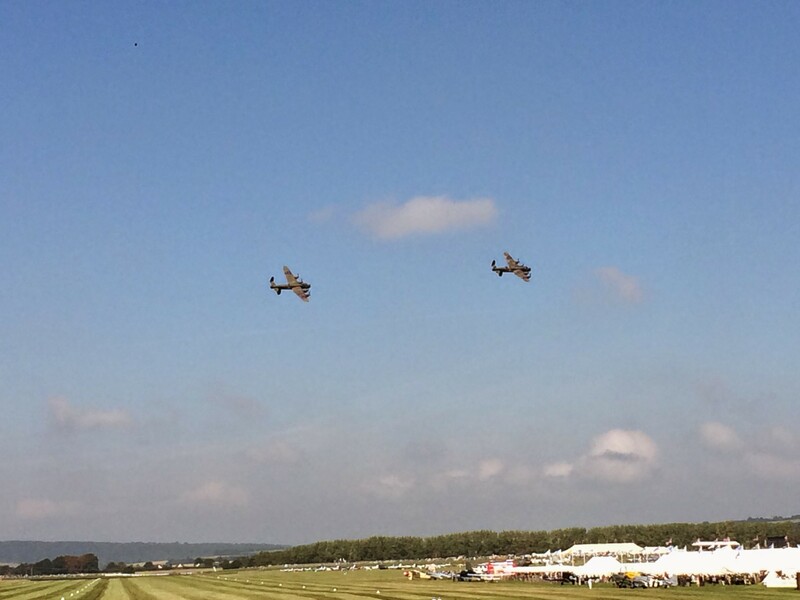 The Lancasters circling the racetrack at Goodwood. As the 6 weeks passed there were a number of fantastic sights and displays that I was not lucky enough to see. Old Warden Flying Proms, for example, with the Lancasters displaying to the Dambuster’s march played by a live orchestra. Then there were the 3 Lancaster events at East Kirkby, with both aircraft flying over a taxiing Lancaster in the shape of “Just Jane”, as well of course as the tours final act, both Lancasters flying over Derwent damn in a stunning salute to the Dambuster’s raid. It was fitting that on Veras final departure from RAF Coningsby, its home for almost two months, she was escorted by the RAFs own Lancaster as well as a pair of Hurricanes and a pair of Spitfires. Even more fitting that they flew the very same route that was scrubbed on their arrival, overflying Lincoln Cathedral as an iconic finale to a historic tour. Even the flight back across to Canada had some memorable moments. On the final over water leg, the Lancaster ended up arriving on Canadian soil in the rain and in the dark! Surely the first time a Lancaster has flown at night since the 50s, what a moment it must have been for the crew and those on the ground alike! Arriving back at the Canadian Warplane Heritage Museum in Hamilton on the 28th September, the book was finally closed on the historic tour. As always with an event such as this, there will be those who feel they missed out, and there were undoubtedly some opportunities missed. But the fact remains that through airshows and fly-pasts alike, countless people will have got to see, hear and feel what a pair of Avro Lancasters flying together is like. I cannot think of any other aviation event in my lifetime that has been met with such excitement across the whole country. For that I’d like to thank the Canadian Warplane Heritage team as well as the BBMF. Both teams had a number of difficult, frustrating days in order to make this tour run as smoothly as it has. I think the massive crowds assembled everywhere the pair appeared and everywhere in-between speaks volumes about the tours success. I can only hope I hope it has brought as much success for the touring party as it has brought joy to the British public. For more (and better!!) pictures of the pair, I recommend looking through the”Airshows” and “Warbirds” sections of the forums at http://www.airshows.co.uk. There are also some wonderful shots in evening light from the Global Aviation Resources report on the Shuttleworth Flying Proms: http://www.globalaviationresource.com/v2/2014/09/22/aviation-event-review-old-warden-flying-proms-2014/. The Battle Of Britain Memorial Flight: http://www.raf.mod.uk/bbmf/. Thank you for this love story and your memories. Social media allowed the romance of the summer to be experienced world wide. #Lanc2UK then #2LancsUK and #BomberTour14 had AVgeeks and Lanc lovers in a flutter of sharing the excitement and suspense beginning to end and it was the happiest of endings. The Merlin engine returned with gratitude to BBMF, a memento of the EPIC experience…so a part of Vera will be flying in the UK.